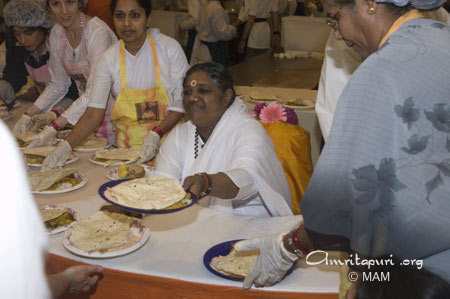 A photo of Amma handing out prasad to devotees gathered for the retreat in LA 2007. The majority of devotees attending Amma’s Los Angeles Retreat had no idea what a “playback singer” was when it was announced that “playback singer” Sonu Nigam would soon be performing a couple of songs for Amma. But during the next 20 minutes, the residents of Hollywood were completely won over by the Bollywood superstar whose voice has become a staple of the Indian film-industry during the past 10 years. Accompanying himself on harmonium, Sonu offered two songs to Amma, saying from the stage that “Destiny has brought me here today.” The first song, “Sukh Me San Saathi Dukh Mein Na Koyi” was made popular by Mohammed Rafi. The second, “Jag Me Sundar Hai Do Naam,” was an Anoop Jalota bhajan. 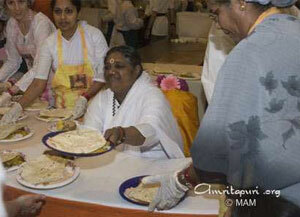 Amma activities have started in Portugal in a big way. 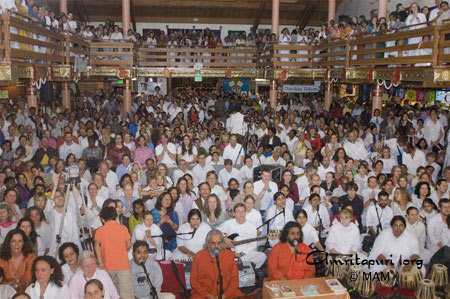 The Amma satsang group in Lisbon, the beautiful capitol city of Portugal, had invited Br. 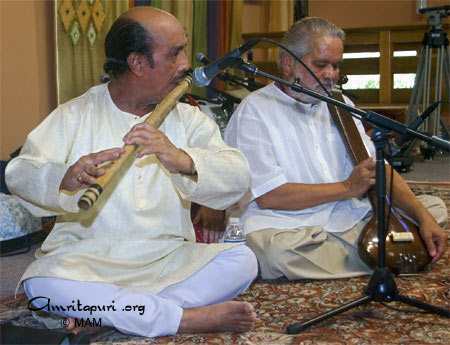 Shubamrita Chaitanya for an evening programme of public talk, bhajans and meditation there on the 30th May, 2007. Being the first official programme there, nobody knew what to expect. But, before the venue was open for the evening programme, people were already waiting outside. By the time the programme started the whole hall was fully packed and people were asked to sit on the stage. None of the people moved till the end of the programme and sat through with rapt attention. The only question that people had to ask Br. Shubamrita was, “When are you bringing Amma to Portugal? We can hardly wait to see Her.”On the second day evening, seeing the response on the first day, a programme was arranged at the Radha Krishna temple there. Though there was no prior announcement or information, still many found about it and reached the venue to take part in satsang and bhajans. Portugal is another country in line waiting for Amma’s visit. Over the past couple of years, it has become a tradition for Amma to add a few new English bhajans to her songbook around the time of her annual summer tour of North America. And this year, the first night of Amma’s “Northwest Retreat” near Seattle found Amma holding true to the custom. Towards the end of the bhajans, Amma sang for the first time a bhajan called “Awaken, Children” written by one of her American daughters. One unique thing about the song is that the devotee who composed it has a deep love for the American gospel tradition, and parts of the song bear a subtle reflection of that influence. Awaken to the truth within your self. Although gospel music took birth in America, it is the result of a mix of non-American influences—mainly European choir music and the rhythms and call-and-response melodies brought to America through African slaves. As the enslaved men and women toiled away in the fields of their masters, they would sing. One would call out, and the rest would respond in unison. The rhythms for the songs would serve for their work as well, creating a pace for the day’s labor. Naturally, these forms began appearing in the Black churches as well, becoming a fully bona-fide musical movement by the early 1900s. It is interesting that the devotional songs of India also employ call and response. Is it something inherent in the call for liberation—whether physical or spiritual—that lends itself to the form? Certainly, in the cries of the field music of the slaves, the two longings blurred together. And that merger has continued in gospel through the present day. After all, it was a traditional gospel song that served as the foundation for “We Shall Overcome,” the rallying cry of Dr. Martin Luther King Jr.’s American civil rites movement of the 1960s. Of course, in Amma’s hands, the song becomes something else entirely, something wholly original—a song from Beyond to the entire world.